Before and after photos of a new construction mold remediation job we recently completed in the crawl space of a large commercial structure. The fire-retardant product contains gypsum (think sheetrock) and is sprayed on wet. Because the crawl space was not conditioned the interior relative humidity remained quite high, and as a result the product took too long to dry and got all molded up with Aspergillus. Quite the dramatic difference between pre and post, isn't it? They should be fine now as long as the dedicated dehumidification system is sufficiently sized for this large crawl space. Great work by our team of certified mold remediators at Palmetto Environmental Solutions! 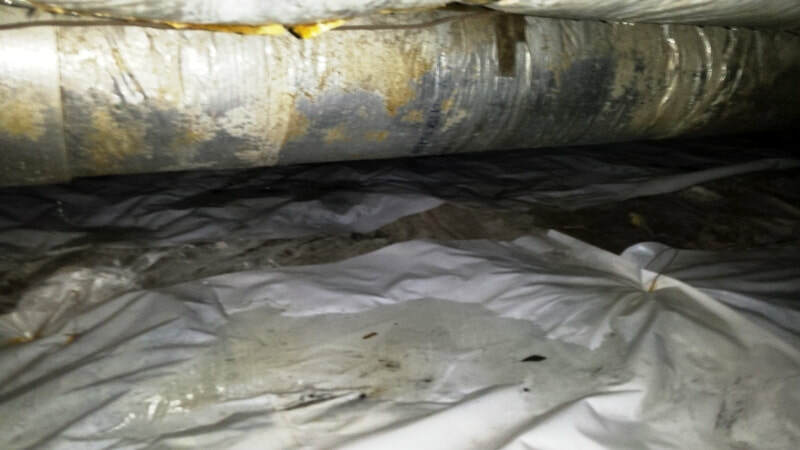 The issues with this crawl space - mold growth, moisture-damaged insulation, and a compromised and ineffective surface vapor barrier - were all discovered during a home inspection as part of a real estate transaction. The clock was ticking and the contract was in jeopardy. 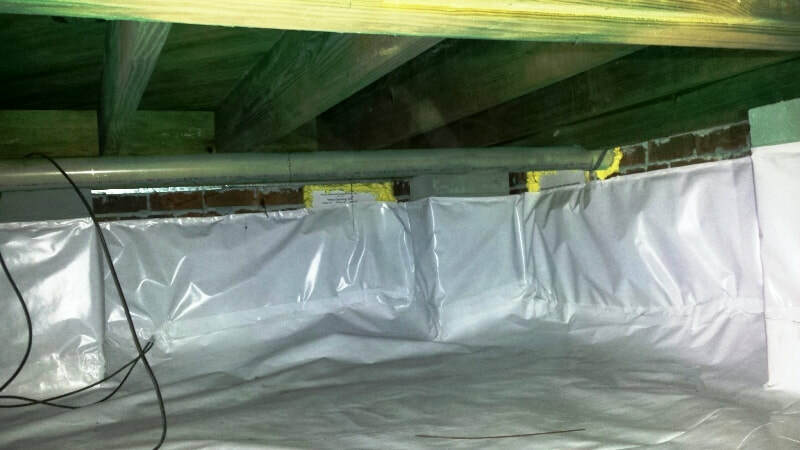 We removed and replaced the damaged insulation, installed a new reinforced vapor barrier, and remediated the mold growth. The closing took place as scheduled and the deal was saved! 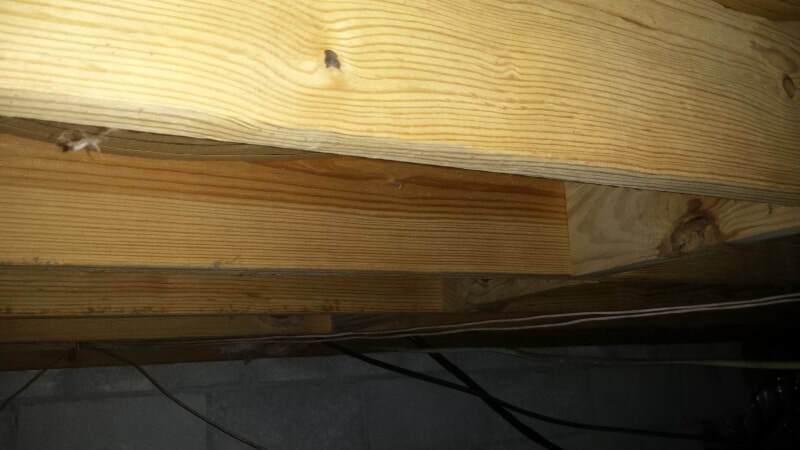 A typical vented crawl space in South Carolina: 1) The compromised original builder's grade surface barrier exposes the entire environment to ground water vapor intrusion, 2) The fiberglass insulation batts in the ceiling are dropping from the weight of absorbed moisture, 3) Extensive mold growth on the structural joists, 4) Fungal wood rot to the underside of the subfloor due to excessively moist conditions and moisture trapping by the insulation batts, and 5) Heavy efflorescence on the interior foundation wall signifying considerable ground/surface water intrusions through the wall. Our project here included: 1) Removing the insulation, 2) Remediating the mold/fungal growth (some of the subfloor sections were in advanced stages of wood rot and needed to be replaced), 3) Installing a 40' long French drain, sump well and pump to collect and discharge future ground/surface water intrusions, 4) Sealing the foundation vents to prevent the infiltration of seasonally warm, moist outdoor air, 5) Encapsulating the crawl space with reinforced poly including wrapping the foundation walls and piers, 6) Installing an Aprilaire 1820 dehumidifier with intake and exhaust ducting to accommodate the sectional configuration of this crawl space, and 7) providing antimicrobial disinfectant treatments of both the crawl space and the living space above. Additionally, the homeowners agreed to install gutters and downspouts where missing to alleviate much of the water intrusion issue. 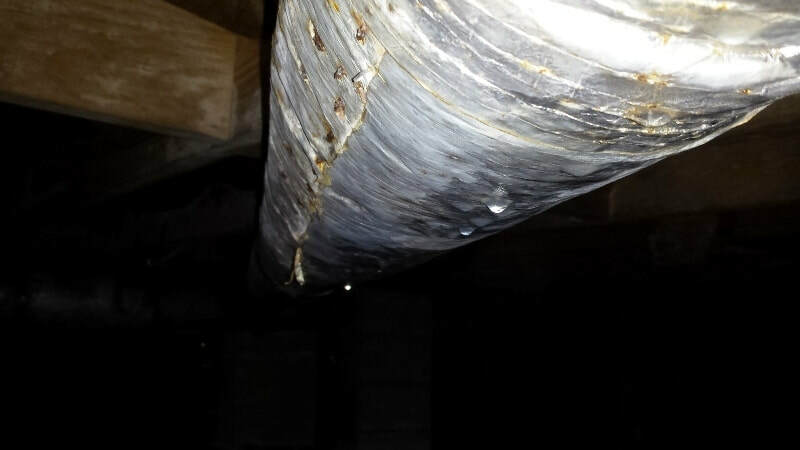 This HVAC air handler in a seasonal property had an ongoing condensate leak. 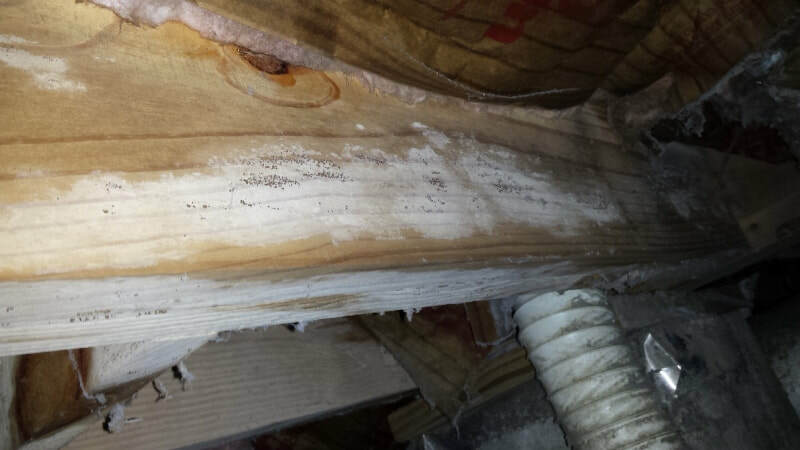 This resulted in mold contamination to the wood and sheetrock in the closet, and high spore counts in the home's indoor air. We remediated the Penicillium/Aspergillus growth, cleaned the affected surfaces, disinfected the entire home with an antimicrobial solution, and achieved 3rd party independent laboratory clearance on the post-project air samples. In many cases crawl space work does not have to be extensive or overly expensive. 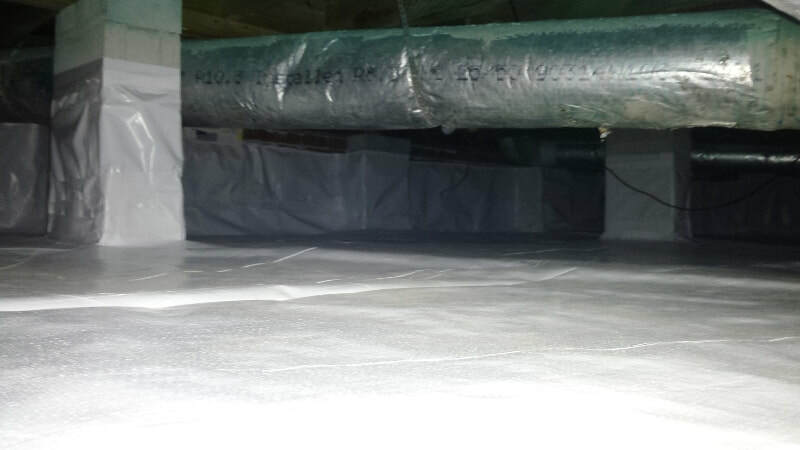 In this example there was already a good surface vapor barrier. We just needed to close up some gaps to provide complete ground coverage. The HVAC ducts were sweating from moist outdoor air entering through the foundation vents and condensing on these cooler surfaces as you can see by the puddles and dripping in the photos above. 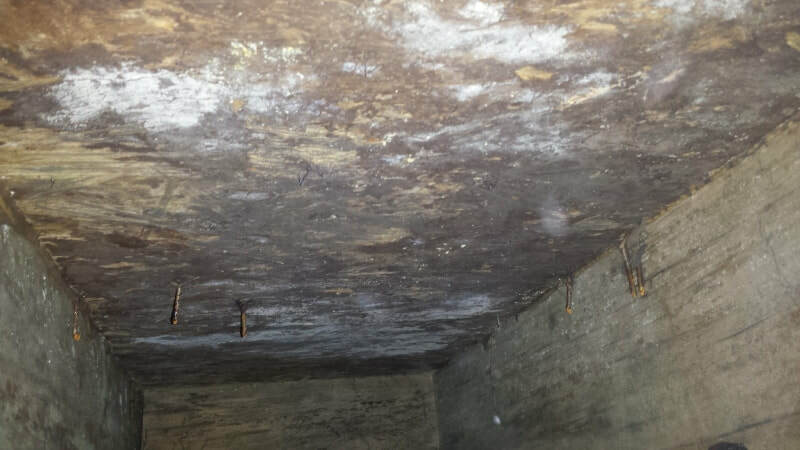 Due to this damp environment the moisture content of the structural wood joists was of a sufficiently high level to support microbial growth as evidenced by the pictured Penicillium/Aspergillus mold growth. To remedy this situation we sealed up the foundation vents and other outdoor air intrusion points and took control of the environment with a Santa Fe Advance2 high capacity dehumidifier - suspended from the joists - and a pump to discharge the condensate water to the outside of the structure. We finished the job with remediation and cleaning of the joists, followed by an antimicrobial treatment of the entire crawl space. 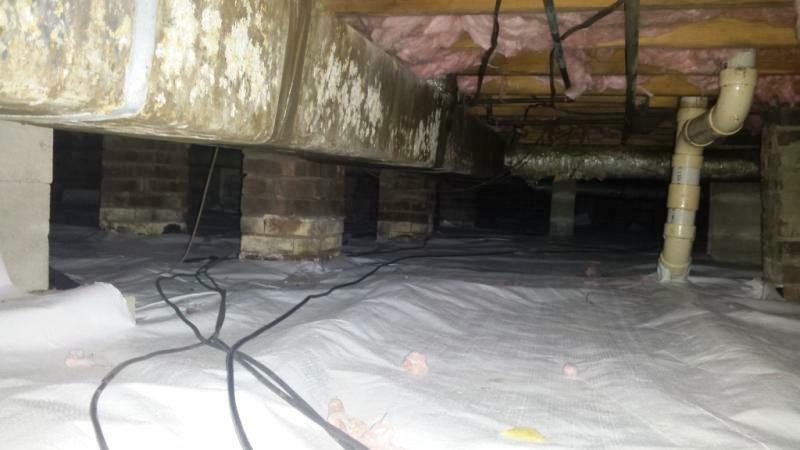 This vented crawl space had it all: Mold-ridden structural joists, animal infestation, a fully compromised original builder's-grade surface vapor barrier, moisture soaked insulation dropping from the ceiling. 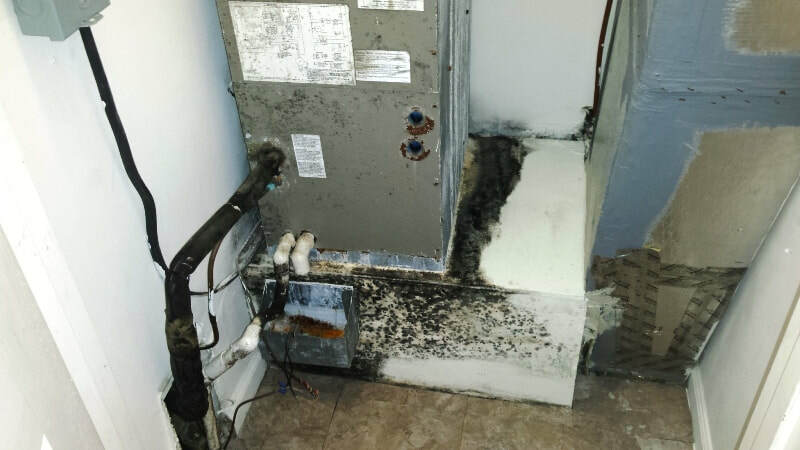 The homeowners were paying the price for this, both figuratively in terms of an odorous and unhealthy air quality in the living space, and literally from the havoc this extremely damp condition was wreaking on the efficiency and performance of their HVAC system. 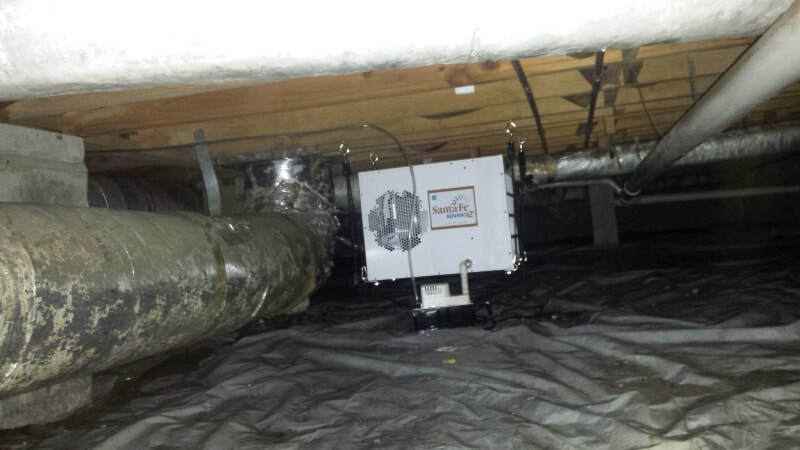 But here again, not every crawl space solution has to be an encapsulation with a dehumidifier. In this case we fixed the insulation issues, sealed the vents and other outdoor air intrusion sources, installed a reinforced 12 mil surface vapor barrier, remediated the mold and cleaned the joists, installed an ATMOX system to take control of the crawl space environment, and replaced the deteriorated metal access door with a weatherproof model that also provides a sufficiently airtight seal. 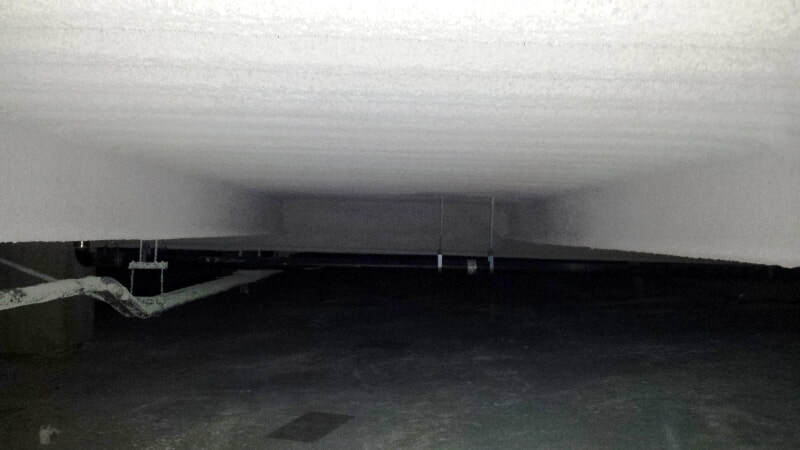 The result was a clean, dry crawl space and noticeably dramatic improvements in living space air quality and HVAC performance. 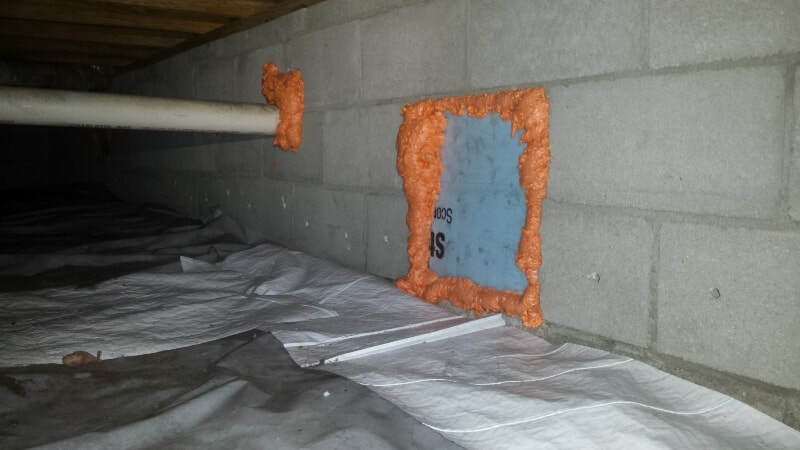 This vented crawl space had no surface vapor barrier. 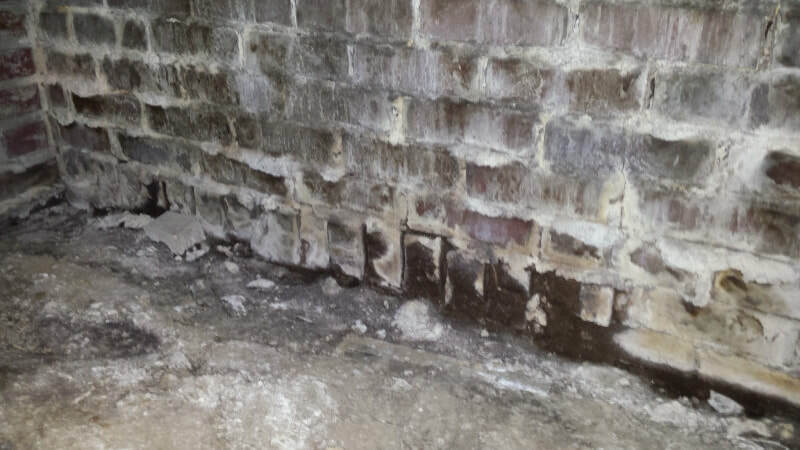 The combination of moist outdoor air infiltration through foundation vents and ground water vapor intrusion from the exposed earthen surface resulted in an extremely damp and musty crawl space condition. 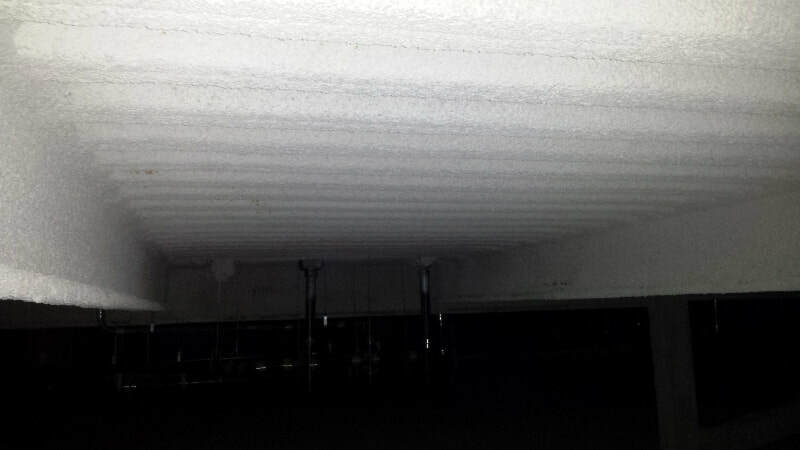 Condensation on joists and HVAC ducts was widespread, and in the top left photo water droplets can even be seen in the fiberglass batt insulation. The weight of this absorbed moisture was causing batts to drop from the ceiling. Fungal growth was present on the dirt surface, and there was also Penicillium/Aspergillus mold growth on the structural joists. 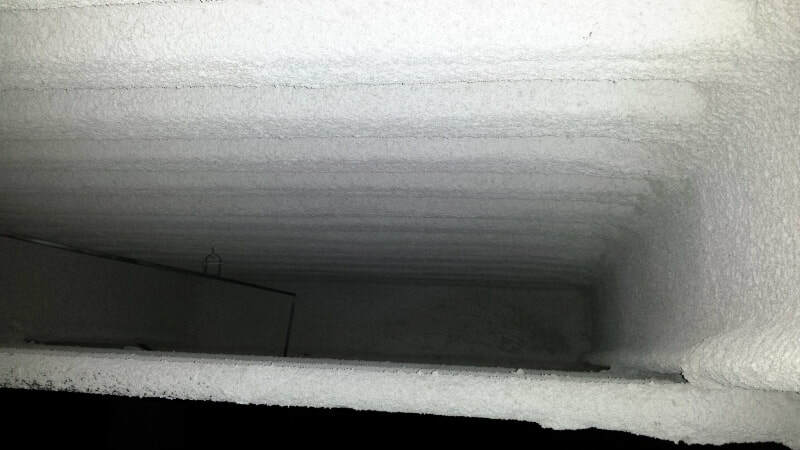 Due to the Stack Effect - the naturally occurring bottom-to-top flow of air within a structure - indoor air quality in the living space above was suffering and the HVAC system was working overtime to condition the humid air. Additionally, the homeowners wished to install a new solid hardwood floor but with the high subfloor moisture content this would have been problematic. 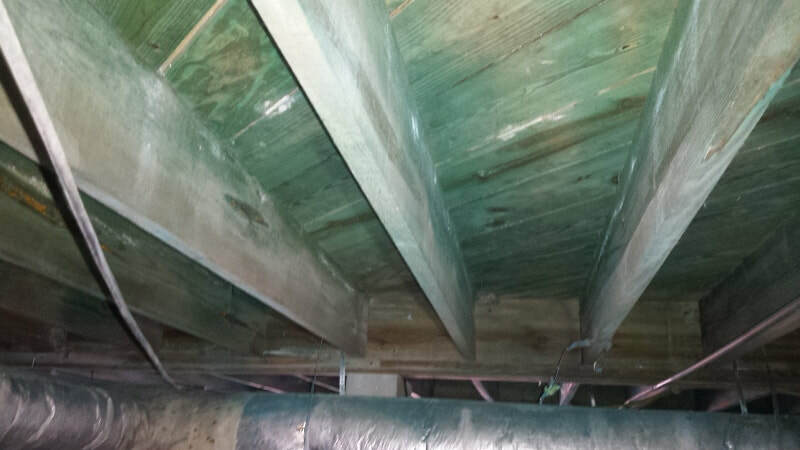 This excessively moist crawl space was deemed a good candidate for a full encapsulation, and as you can tell from the "After" photos that is what we did. 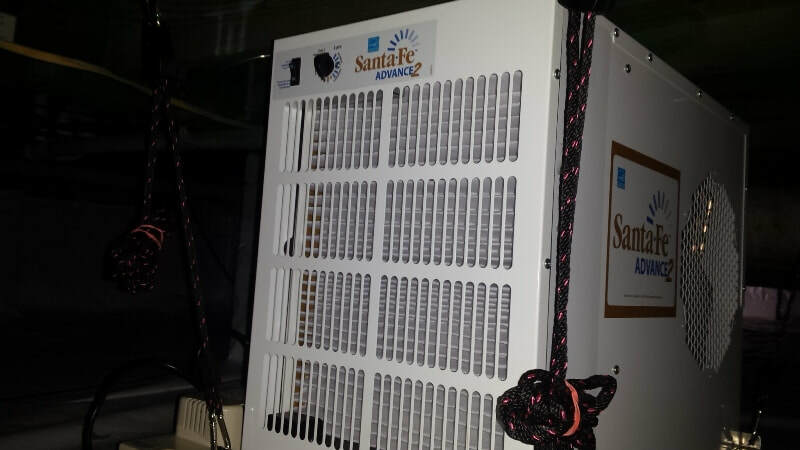 Additionally, we stripped out all the insulation from the crawl space ceiling so that the structural wood and subfloor would be fully exposed to the drying action of the installed Santa Fe Advance2 dehumidifier. We also remediated the mold, cleaned the joists, installed a new weatherproof access door, and finished with an antimicrobial disinfectant treatment of both the crawl and living spaces.